Every mapping that need to read data from relational or flat file sources, includes a Source Qualifier transformation, representing all data read from the source and temporarily stored by the integration service. The source qualifier represents the rows that the integration service reads from the source when it runs a session. 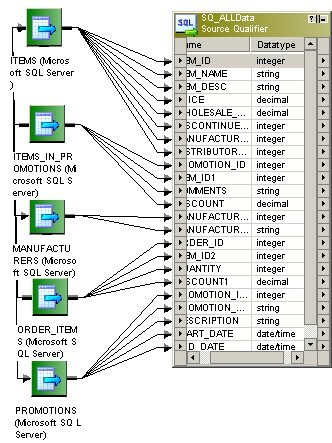 When the source is a database, you will find on this transformation the SQL query. The SQL query and other attributes can be override by the session attributes when the mapping is run. When you create a single Source Qualifier transformation, the PowerCenter - Integration Service increases performance with a single read on the source database instead of multiple reads.